Are you a die-hard Gator? Do you bleed orange and blue? We need you! 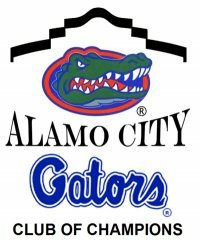 The Alamo City Gator Club is actively seeking more participants. Volunteer to help plan an event, attend our wine tasting or help a charity on International Gator Day. We have a spot for every Gator! The easiest way to help the club is to to join the Alumni Association. Each new member in the Alamo City Gator Club adds to our numbers and allows us to bring better programming and services to you and the San Antonio Nation. Thank you for your interest, and GO GATORS!